If wireless headphones are a bit too heavy and inconvenient for you, you might as well search for the best wireless earbuds, this guide covers the top 10 in this category. Wireless earbuds gained popularity mainly because it is compact, lightweight and hassle-free. Unlike Bluetooth headsets that are usually only used for hands-free phone calls, wireless earbuds are great for music listening too. Truth be told, when it comes to wireless music listening, headphones are still the first ones that come to mind. However, when you’re always on the go and you live an active lifestyle, full-sized headphones are not ideal. The best wireless earbuds, on the other hand, provide convenience and comfort, without sacrificing sound quality and without taking the full music listening experience. Through Bluetooth connection, you can still listen to your music and even take calls without having to worry about tangled wires or having to connect your earbuds directly to a smartphone or another portable device. The best wireless earbuds can be used by individuals who are always on the go; however, it is most popular with people who workout, run, hike, engage in sports and other rigorous activities. Because of this, it is ideal for your wireless earbuds to be sweat-proof. Durability is also very important because you want one that won’t give up on you within weeks or months from purchase. Of course, the main purpose of wireless earbuds is for added convenience whether you intend to use it for hands-free calling or music listening. Most of the best wireless earbuds are designed ergonomically for a comfortable and secure fit. Some have ear hooks so that no matter how rigorous your workout can get, the earbuds won’t fall off. Most earbuds come with extra tips in different sizes so that you can find which one fits best for your ear size. As always, when you’re shopping for earbuds, it should have superior sound quality. You’ll be surprised that there are many affordable wireless earbuds that can produce impressive sound quality that allows you to enjoy any type of music. The built-in microphone should also be of the best quality so that your voice remains clear while on the phone. Sound isolation or noise cancellation is an additional feature that’s great to have too. Since it is wireless, these earbuds work on battery power. There are some of the best wireless earbuds that would last for only over 3 hours of continuous playback before it requires charging while others can offer up to 10 hours of listening and talking. If you intend to use your earbuds for listening to music, it is best to choose ones with longer battery life. If you are only using it during workout or for taking calls, then 3+ hours should be enough. 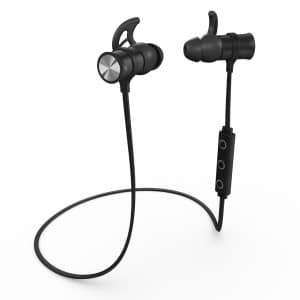 Conveniently claiming the first place on this list of top 10 best wireless earbuds is the TaoTronics Wireless Earphones for Running with Mic which is a top-notch product for many reasons. Its attractive price tag with over a thousand happy customers generously giving it positive feedback, are only some of the reasons this pair deserves your attention. 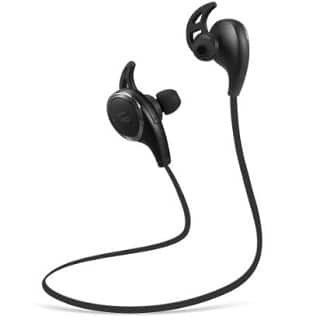 The TaoTronics Wireless Earphones for Running with Mic is a pair of Bluetooth headphones. It comes with the latest Bluetooth 4.1 technology that allows seamless connection with superior reproduction of audio whether you use it for listening to music or to take calls. It also features the CVC Noise Cancellation 6.0 technology, which effectively reduces excessive outside noise that allows you to hear the sound from your earbuds well, and if you’re taking calls on your phone, the other line can also hear you clearly through the built-in microphone. It is compatible with most Bluetooth-enabled devices such as smartphones, tablets, music players, laptops, etc. Sound quality is topnotch. In fact, this pair of earbuds boasts of an aptX codec that provides crystal clear and pure high quality sound. Its minimum standby time is 175 hours and talk or playback time of 5 hours with its built-in Lithium Ion battery. More importantly, the TaoTronics Wireless Earphones for Running with Mic is very comfortable to wear which makes it a more ideal pair of Bluetooth headphones compared to full-sized headphones. You can use it for your travels, for daily casual listening and talking, in the office, while working out and running and more. 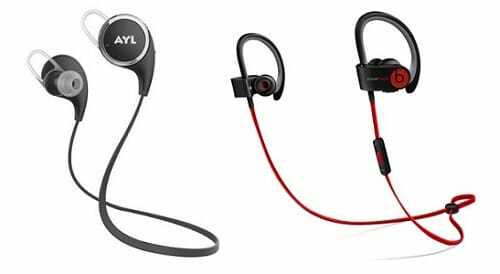 The AYL Bluetooth Headphones is also another very deserving pair of earbuds that rightfully claims at least a spot in our top 10 list. If you managed to catch it on sale, you can get it at a very low price. It has also received great ratings from thousands of customers. All these happy customers have many great things to say about these earbuds but among the common comments that you’d see from these owners of the AYL Bluetooth Headphones are ones that claim its topnotch sound quality and incredible comfort when worn. 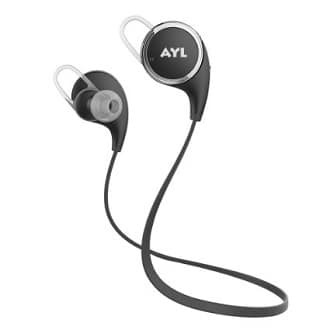 The AYL Bluetooth Headphones features EDR APT-X audio decode technology and when matched with Bluetooth 4.1 technology, you’re getting a seamless connection with superior audio reproduction that is quite comparable to wired earbuds or other more expensive pairs. Noise cancellation is quite impressive as well with its CVC 6.0 Digital Noise Reduction technology that gives you clearer sound while on a call or when listening to you music. The best wireless earbuds can be paired to up to 2 Bluetooth devices simultaneously that allows you to listen to music on a separate music player and gives you the chance to answer calls wirelessly on your smartphone. Thanks to its polymer 80mAh battery, you’re getting a very impressive 7-hour talk and playtime with up to 175 hours of standby time, which is more than your usual pair. 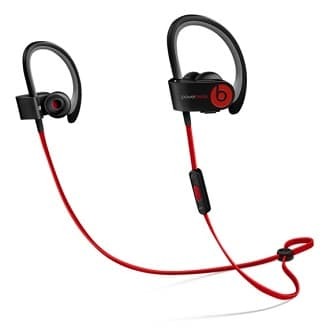 Last bu not the least, you can pair your earbuds with devices up to 10 meters away from where you are which makes this sweatproof pair an even more ideal choice for those who intend to use this while in the gym. 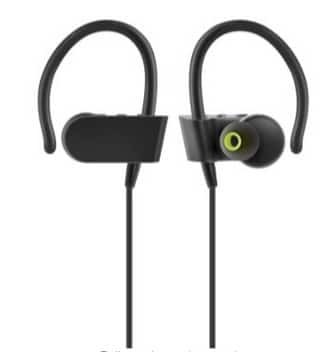 An average of 4.3 stars in ratings from over 200 customers only goes to show that the SoundPEATS QY8 Bluetooth 4.1 Wireless Sports Headphones is also deserving of one of the top spots on this list. This is actually a great deal because you’re getting a pair that’s worth over a hundred dollars for less than a quarter its original price but you still get too keep all the incredible features that come with it. The SoundPEATS QY8 Bluetooth 4.1 Wireless Sports Headphones is sweat-proof, lightweight and features an ergonomic design, which makes it a very comfortable pair. You even get additional sets of ear bus and ear hooks so that you can choose the one which is most comfortable for you or you can use these to replace the one you’re using once it gets worn out. Durability is topnotch too as it is built for those who live an active lifestyle so you can expect this to be a very practical pair that should last for years. Battery life of the best wireless earbuds is quite impressive too with up to 5 hours of playtime or talk time. The sound quality of the SoundPEATS QY8 Bluetooth 4.1 Wireless Sports Headphones is also one of the best – again, you’re getting a pair that’s worth over a hundred dollars so you can expect only the best. Its built-in microphone also received praises from owners of this pair as produces very high quality and clear voice for your phone conversations. 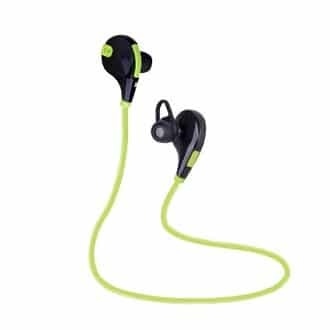 Its Bluetooth 4.1 feature, advanced Pure Sound and SignalPlus technology makes the SoundPEATS QY8 Bluetooth 4.1 Wireless Sports Headphones a pair that surely tops the rest. It is compatible with most smartphones and other Bluetooth-enabled devices too. SoundPEATS sure did their homework when it comes to wireless earbuds as they earned another spot on this list with the SoundPEATS Q9A Wireless Bluetooth Sweatproof Secure Fit Earbuds. A very attractive pair which has been impressively reviewed by over a thousand of customers, you can’t go wrong with this pair. Once again, this is a hundred-dollar pair but it now sells for a very affordable price. For such a low price, you’re essentially getting a pair that’s very comparable to others that cost hundreds of dollars. 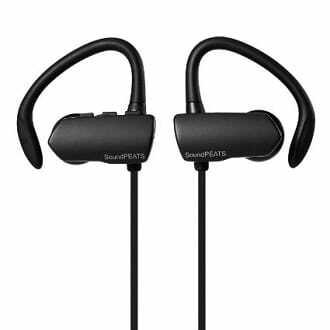 What makes the SoundPEATS Q9A Wireless Bluetooth Sweatproof Secure Fit Earbuds stand out is its very comfortable and secure fit. It features ear hooks that will keep the earbuds secure around your ears without giving you such a pressured and heavy feeling, thanks to its ergonomic design. It is sweatproof and again, made for those who live an active lifestyle so you can only expect durability at its best. You can get a full charge within just 1 to 2 hours with the SoundPEATS Q9A Wireless Bluetooth Sweatproof Secure Fit Earbuds and you can already enjoy up to 5 hours of premium quality operation whether you intend to use it for phone calls or for listening to music. Sound quality of the best wireless earbuds is so impressive thanks to its cutting edge Bluetooth 4.1 technology combined with an advanced aptX sound. With a pair as good as this – impressive bass, clear highs and lows matched with 100% comfort even if you wear it the entire day, you don’t have to look for anything else other that this pair from SoundPEATS. 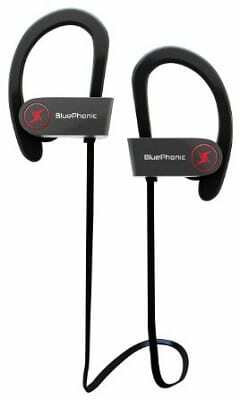 It might be more than double the price of the previous pairs on this list but the Wireless Sport Bluetooth Headphones by Bluephonic still deserves a second look. It has been reviewed by hundreds of customers and audiophiles and has so far received great ratings. Its look and feel alone already makes it worth every dollar you will be spending for it. Yes, it looks very attractive and rather stylish and its ergonomic design makes it one of the most comfortable pairs you’ll ever own. Since it is designed as workout earbuds, it is sweatproof, stable and fits securely thanks to its ear hooks. What makes it a standout and worth the extra money you’ll be paying for it is its impressive battery life. You’re getting up to 8 hours of talk time or playtime and up to 240 hours standby time. You’re lucky to get up to 5 hours on other pairs. Yes, the best wireless earbuds come with a built-in microphone so you can use it for phone calls too. Audio performance is nothing short of fantastic. It is even more appealing with its CVC6.0 Noise Cancelling Technology that effectively reduces excessive background noise when you’re on the phone and its HD beats combined with EDR Audio technologies give you the riches bass, impressive acoustics and amazing clarity. The actual earbuds have play/pause and volume control buttons built-in as well so you can use it completely wirelessly. Each package of the Wireless Sport Bluetooth Headphones by Bluephonic already comes with the earbuds, 3 extra ear tips in various sizes, a manual guide, a universal micro USB charger and a luxury travel case. Photive isn’t exactly the most famous brand for earbuds but it has made its way to become a popular choice among audio enthusiasts and even audiophiles and professionals. Venturing into the wireless Bluetooth earbuds game, the brand did not disappoint when they released the Photive PH-BTE70 Wireless Bluetooth Earbuds. In fact, this model is quite a seller and has received impressive reviews from various critics and professional reviewers. Though it sells double the price of most of the wireless earbuds that have previously been covered on this list, its price tag is worth every penny for sure. First of all, it is important to mention that the Photive PH-BTE70 Wireless Bluetooth Earbuds features a sweat-proof design which makes it the perfect pair of earbuds for those living an active lifestyle. You can enjoy using a pair of the best wireless earbuds while working out, when in transit and even for casual music listening all day long as it is very comfortable and ergonomically designed with ear hooks that fit securely around the ears. 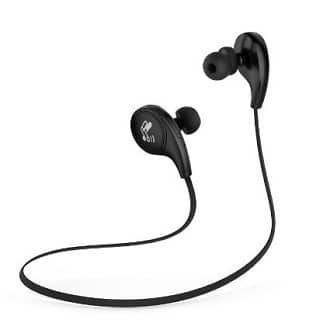 The Photive PH-BTE70 Wireless Bluetooth Earbuds can give you up to 6 hours of playtime and its amazing sound quality is attributed to its advanced aptX sound feature plus seamless Bluetooth 4.0 technology connection. Despite its very compact size, it still features very easy to use on-board controls that lets you receive and end calls, skip tracks or play and pause music – completely wirelessly without having to reach out for your device. It is compatible with most Bluetooth-enabled smartphones, tablets, music players and other devices. After a couple of pricier pairs that are previously featured on this list, here are affordable earbuds that are not only impressively powerful and functional but very attractive too. The Bestfy QY7 Bluetooth 4.1 Wireless Sports Headphones is as simple as you want your pair to be but as functional as you need it to be. It is so easy to use that even the non-tech savvy individuals would appreciate it. Some customers would even compare this pair’s sound quality to those from Sony or Bose, which are usually more expensive ones. It can give you enough bass richness and very clear sound quality that lets you enjoy any type of music you listen to and very clear phone calls as well. It is worthy to mention that the Bestfy QY7 Bluetooth 4.1 Wireless Sports Headphones features an ergonomic design. It smooth silicone gel surface and earbuds comfortably and securely fits most ear sizes. Of course, you also get 2 extra pairs of small and large-sized earbuds that you can interchange with the medium one that’s already on the headphones when you receive it. You also get an extra pair of ear hooks. What’s most impressive with the Bestfy QY7 Bluetooth 4.1 Wireless Sports Headphones is its battery life, which can give you up to 8 hours of music or talk time within just one full charge. Standby time can reach up to 14 days! With the amazing sound quality and topnotch battery and simple design of the best wireless earbuds, you’re getting the best out of your money with this pair of wireless earbuds. Unlike the first seven wireless earbuds included on this list, the Singer Beats Wireless Sports Headset is completely wireless. By completely wireless, we mean there are zero wires. You basically get two earbuds that you can attach directly to your ear. No worries though because you won’t lose one in your bag or worry about damage because the package comes with a small stand which also serves as its charging dock. It is quite pricey but it usually goes on sale which is already a bargain deal considering what you get with the package. Aside from the charging dock and the actual pair of the best wireless earbuds, you also get 3 sets of ear tips and ear hooks in small, medium and large, and a USB cable for charging. The Singer Beats Wireless Sports Headset is very lightweight and it’s sweat-proof too which makes it ideal to use when working out or if you’re one who lives an active lifestyle. It is very comfortable to wear and it stays secure too – perfect for all ear sizes. The sound quality is superb with the Singer Beats Wireless Sports Headset’s Bluetooth 4.1 + EDR feature, which gives you impressive bass, amazing stereo sound and just clear sound no matter the volume level. In addition, it is very easy to use. It comes with a voice notification for incoming calls with the phone number of who’s calling as well as voice dialing features. Its built-in microphone is superior too. The earbuds are built with simple to use control buttons and operation range is up to 30 feet in open spaces. On each full charge, you get up to 5 hours of music and talk time. Just like the previous pair reviewed on this list, the Eaglewood Small Wireless Bluetooth 4.0 Invisible Earphone is also completely wireless; hence the “invisible” tag on its product name. The best part? It only costs at a very low price. It is available in black and coffee (light brown) and though it remains practically invisible since there are no wires at all, it is still great how this pair looks very simple yet sleek and classy. It is lightweight and very portable. It is super comfortable to wear too. Since it is very light and compact, you wouldn’t even notice that you’re wearing earphones. You can practically have it on your ears the whole day without any feeling of discomfort or being tired. 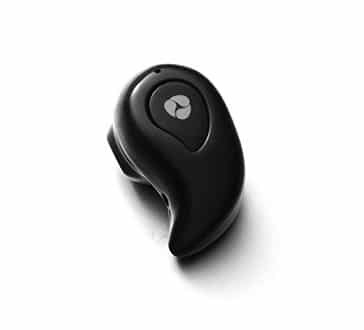 The Eaglewood Small Wireless Bluetooth 4.0 Invisible Earphone is compatible with most Bluetooth-enabled smartphones, music players and other portable devices. Connection and pairing is very easy too. One you pair a smartphone or another device, it automatically connects if you use it again in the future. Battery life is quite good with up to 3.5 hours of playtime and up to 4 hours of talk time with a single full charge. The Bluetooth operation range is up to 10 meters. It also comes with a built-in HD and sensitivity microphone. It is very important for you to note though that this you are not getting a pair of earphones when you purchase the Eaglewood Small Wireless Bluetooth 4.0 Invisible Earphone. This is only one piece of earphone that’s meant for the right ear. Last but definitely not the least on this list of top 10 best wireless earbuds is the Phaiser BHS-730 Bluetooth Earbuds. You can choose from 4 different colors, which are all very attractive and classy. The Phaiser BHS-730 Bluetooth Earbuds is compatible with most Bluetooth devices including smartphones, music players, tablets, etc. It is very comfortable to wear too, thanks to its memory foam tips. It fits securely because of its patented winged tips that stay in place even during workouts. You can choose from over or under-ear fit options, whichever is most convenient for you. Best of all, the Phaiser BHS-730 Bluetooth Earbuds includes a lifetime sweatproof warranty. You will never have any problems with water damage as it is protected by Liquipel Nano Coating. Another unique feature of this pair are its magnetic casings so you can easily secure the earbuds around your neck when not in use. Sound quality is amazing thanks to the Phaiser BHS-730 Bluetooth Earbuds’ 8mm speakers. It Bluetooth 4.1 technology allows seamless connection and streaming of HD sound that’s super clear and accurate. In addition, noise cancellation and total isolation is very impressive through its bullet-shaped Comply T-400M memory foam tips. It might be a tad bit pricier than most of the wireless earbuds on this list but with a guarantee of durability and impressive sound quality, it is certainly worth your money!